June 9, 2016, 8:30 PM · It may be a new "Golden Period" for violin and viola making, but what do those new instruments actually sound like? Violists had a rare chance to hear 17 modern violas and seven bows on Thursday at the American Viola Society Festival at Oberlin Conservatory in northern Ohio. 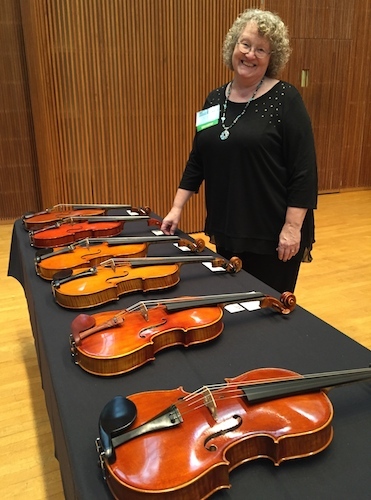 Not only that, but a number of the luthiers and bowmakers were also on hand at the event, as many will stay next week for the annual Violin Society of America's Oberlin workshop. "It's a good time to be violist," said Elias Goldstein, the award-winning violist who played all these violas, ranging in size from 16 to more than 17 1/2 inches, in rapid succession. Goldstein started with his own 1860 Vuillaume, then played the modern instruments, which included violas made as long ago as 1937 (Francois Vial) and as recently as organizer Rodney Mohr's viola bow, which "I just finished yesterday," Mohr said from the stage. Several of the violas also were made in 2016. Beyond the various sizes, Martin Kasperzyk's viola also stood out for its unusual shape and sound. We listened to violas by the following modern makers: David Burgess, Doug Cox, David Finck, Martin Kasperzyk, Stanley Kernoziak, Alex Leyvand, Steven McCann, Pio Montanari, Ansaldo Poggi, William Scott, Robert Spears, Francois Vial, Jason Visaltear, Marilyn Wallin, Isabelle Wilbaux and Ute Zahn. At the end, Goldstein played a c. 1590 A&H Amati. Goldstein also demonstrated wooden bows by Pierre Yves Fuchs, Eric Gagne, Rodney Mohr, Steven Reilly and for fun -- a Dominique Pecatte. The video below shows Goldstein playing a short excerpt from the Walton Concerto and then from the Courante from Bach's Suite No. 3 on 10 of the violas (These were just the videos I happened to get, I'm afraid I missed some good ones!). "I have to say, this feels like speed dating," Goldstein admitted. R-L: Luthiers Isabelle Wilbaux, Ute Zahn, Marilyn Wallin, Rodney Mohr (bowmaker) and William Scott, holding the instruments they made. Photo by Violinist.com. Luthier Marilyn Wallin of Lincoln, Neb. prepares violas for the demonstration. June 10, 2016 at 08:53 AM · Very interesting, thanks for posting this Laurie! On the basis of what I can hear on this video, for me the Amati wins! The Burgess is also quite impressive. June 12, 2016 at 02:11 PM · I loved hearing these instruments. Thanks for covering this Viola fest and for recording this demonstration! June 12, 2016 at 05:39 PM · Hard to listen the same pieces ..the ear getting tired..Regarding me I was impresed by the Martin Kasperzyk's viola and of Marylin Wallin..
June 12, 2016 at 09:52 PM · I was totally amazed at the depth and projection of the Amati. The Cox, Burgess and Wallin were also gorgeous. June 14, 2016 at 11:40 AM · Even with it being a recording, on some instruments it seemed the sound was coming from the instrument and others the sound was coming from around the instrument. The Amati gave me the biggest impression that the sound was coming from around the instrument. Maybe just an personal reaction that would be different in the room.